Are *You* the Reason Behind Fraud Related Chargebacks? We know… Not even your mother thought it was a good idea for you to start a high-risk business, but results are proving her wrong. Your business is the reason people can find their most desired products and services easily online. Though you struggled initially to get your high-risk ecommerce business off the ground, it’s growing by leaps and bounds. Your ideas and tireless marketing activities are undoubtedly the reasons why. Sure, there have been a few bumps in the road — like those early chargebacks. They cost you some, and you paid closer attention to sales for a while. Then things seemed to smooth out again after a few months… until those recent fraud related chargebacks. Well guess what, Mr. Merchant: You’d better find the time. If you step back a moment and take a close look at your business, you might see that YOU are the main reason behind those fraud related chargebacks. And you’re the only one who can fix things to avoid unnecessary disputes. Retail merchants continue to experience fraud at alarmingly high — and growing — rates. Retail fraud rose dramatically (11%) in 2016, as did the costs merchants paid. In 2016, chargeback fraud cost merchants an atrocious $2.40 for every $1 in lost revenue, comprising product loss, banking fines, penalties and administrative costs. Merchant and technical errors explain about 20% of chargebacks. Fraud accounts for the rest: Criminal fraud (transactions using lost or stolen cards/data) accounts for about 10% of merchant chargebacks. Friendly fraud — sometimes called chargeback fraud — causes more than 50%. Friendly fraud (the ugly step-sister of all fraud related chargebacks) involves customers perpetrating fraud, not an identity thief or other unknown third party. 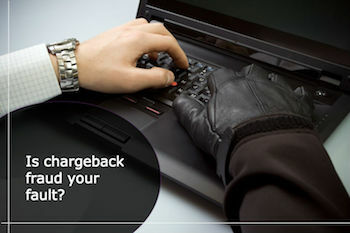 Steps you take with your website, your business model and the data generated during online transactions are your best defense against fraud related chargebacks. They deserve time and attention. Ecommerce businesses thrive or fail for many reasons. One important factor being the website. The same is true when it comes to combating fraud related chargebacks. Start with reviewing your website. Ensure your ecommerce website is PCI-DSS compliant. Use PCI-compliant tools. Publish clear terms and conditions, including your return policy. If product returns are not permitted, state that clearly. Require customers to “check a box” indicating that they understand your terms and conditions before finalizing an order. You can’t control whether customers actually read them, but you can make customers accountable. Showcase a robust fraud-prevention policy on your website. It will make customers more comfortable doing business with you, and will also serve to “warn off” fraudsters. Putting robust best practices in place for your business not only helps protect you from fraud related chargebacks, but also makes it easier to dispute chargebacks of all sorts when they arise. Use an Address Verification System (AVS) and require entry of Card Verification Value (CVV or CVV2) along with card expiry date. These front-line checks help ensure a valid transaction. Always obtain a valid authorization code, and include it on the receipt prepared for your customer. Carefully review rapid-delivery and large orders — as well as multiple orders in a short space of time. All can be signs of fraudulent activity. Don’t hesitate to cancel an order and refund monies paid prior to shipping, if something looks suspicious. Better safe than sorry. Do not charge the credit card until products ship, or in the case of digital products, until the customer downloads the product. Make your billing descriptor clear and recognizable. Use your business name and include a customer service phone number. Sadly, poor customer service leads to many chargebacks for some businesses. As a merchant, you are in complete control of how you treat your customers. Treat them well, and they’ll be less likely to try to rip you off with (unfriendly) fraud related chargebacks. Ensure products and services live up to promises. Under- promise and over-deliver on product quality. Timely, clear, and friendly communication. Confirm orders by email, and send a digital receipt. Send e-mail notifications when products ship and include tracking information. Confirm delivery for all shipments. Require signatures for deliveries over a specific amount (perhaps $100). Make it easy for customers to reach your team if they have a query or complaint. Friendly discussion and quick actions can go a long way toward preventing fraud related chargebacks. While you may not be able to prevent all fraud related chargebacks, keep thorough and accurate records of anything that proves a credit card transaction took place. Good records can go a long way toward ensuring you’re prepared to respond to complaints and to dispute chargebacks that do occur. Store transaction information in a secure (and convenient) place, so it’s easy to access. You’ll have a limited amount of time to respond when you receive notice of a chargeback, so make it easy to comply. Chargebacks may be a cost of doing business, but the goal should be to avoid unnecessary disputes whenever possible. You are in control of your website content and ease of use — business practices — and customer service processes. Choosing the right processing partner is another way to ensure your business is on the right track. If you need help to reduce your chargeback rate over time — including fraud related chargebacks — then choose a payments provider who will help you do it. The right processor will work with you like a partner to ensure you have the right chargeback reduction plan in place and that your payments processing operates seamlessly.